I am not a clean freak. I prefer my house to be clean. But I can function just fine (for a while, at least) if it’s not. 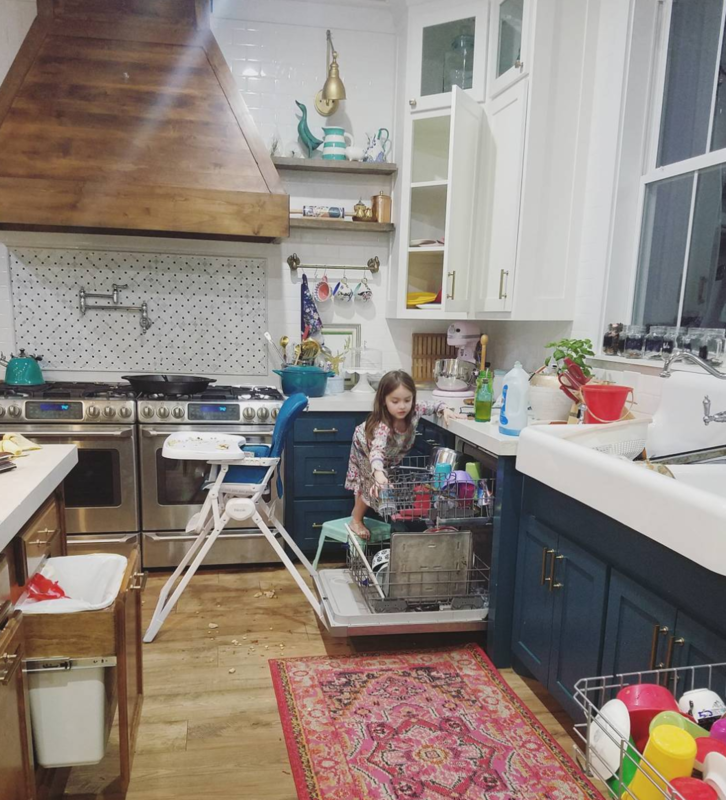 In fact, it doesn’t feel like my house is ever COMPLETELY clean, since if the kids and I have cleaned two of the bathrooms, the high likelihood is that the other three need a scrub (yes, that means we have 5 bathrooms…that might be part of the problem). 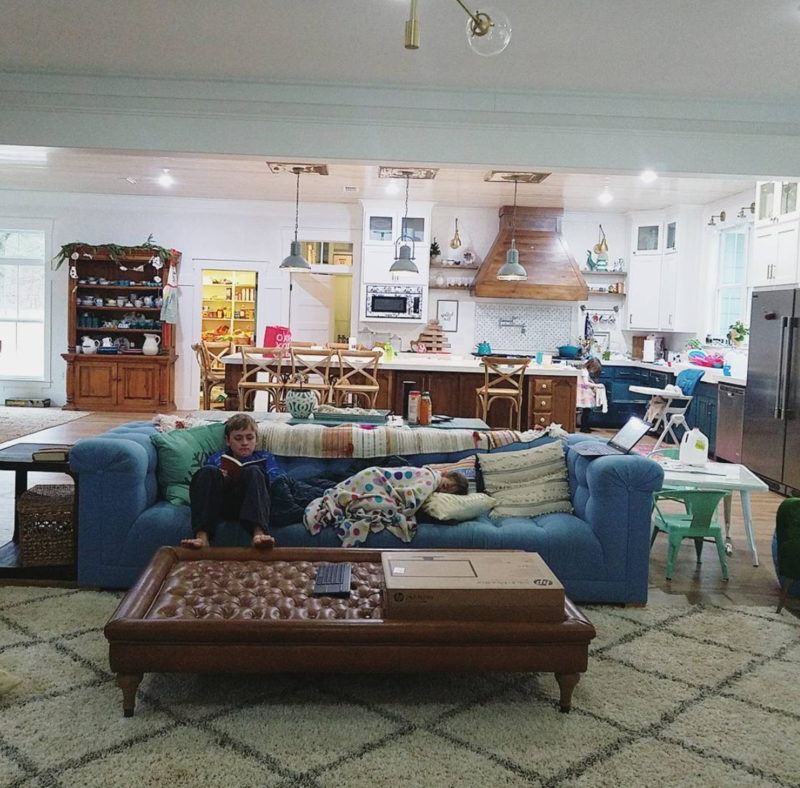 I do not have a compulsive need to deep-clean every surface of my house on a weekly basis, as several of my friends do (which is both a blessing to my sanity–hello, 7 constantly-mess-producing children–and a curse–I know that if I were compulsive, my house would, indeed, be cleaner). HOWEVER, I feel the most mentally at ease and–there’s no better way to put it–okay with myself as a human when my house is picked up and reasonably clean. And that is what today’s Mama Life Hack is supposed to help with. But first a little back story. We clean every morning. After Bible reading and before we start school, the kids all do their “morning routines.” For the girls and Theo, this involves unloading the dishwashers, picking up the common area (living room/dining room/kitchen/stairway) and putting away any toys or books we’ve gotten out (even though this process generally happens between 8 and 9, there have been children up and playing since 6:30 usually, so, yes, there’s already at least some mess by the time the sun comes up). The older boys alternate day-by-day with: 1) loading the breakfast dishes in the dishwasher/cleaning the sink and surrounding counter and 2) sweeping the kitchen/dining and wiping down the island, stove, counters. (I include this detail because I get a lot of questions about what kind of chores my kids do at which ages). During this time, I flip laundry, feed the baby, answer emails, etc. I’m not cleaning alongside them, necessarily, but we’re all doing something productive. This way, we start our school day with things in the spaces we use most under reasonable control. Fast forward to the end of our day, and MOST (not all, but most) of this work has been completely undone. Pencils have been sharpened to nubs and dropped on the ground (thank you, Theo), papers have been shredded on the floor (ahem, Theo again), lunch has been made, snacks X 7 have been eaten…twice (goodness, that’s a lot of food), books have been hauled out of lockers, bathrooms have been strewn with toilet paper (among other things #ew). We try–oh how we try–to put things back as we go. The food gets put back at lunchtime. The paper mounds get picked up. The bathroom gets de-TP’d. But when the focus is on learning, not cleaning, and there are still more messes to be made, it’s inevitable that we miss a pencil or 6, and there’s a doll or 3 under the couch. Oh, and then there’s dinner. I do simple food: Taco soup, chicken tortilla soup, chicken and squash grill, spaghetti, chicken pot pie (my most-well-loved-by-readers recipe). But there’s still some cooking debris that’s inevitable with the process of refereeing 7 kids while preparing food for them (although to be fair, it doesn’t feel like refereeing 90% of the time; they’re honestly usually playing happily, reading, helping me cook, or doing something outside). My point? Despite our best efforts, our main living areas are still at least a little bit messy at the end of every day. And I’m tired. And not the least bit interested in starting all over again with what feels like (no IS) a never-ending process. At first, my emotions rebelled against the simplicity of the suggestion. It couldn’t possibly be THAT easy. But then, I remembered an article I read once about a mother of many (also a homeschooler) who instituted a 5:00 PM clean-up train, in which each member of her household was required to fall in line as they snaked through the entire house picking up errant socks and books and general life detritus. It had sounded intimidating (even though she said they enjoyed it) to me at the time, but I could see the appeal in ending each day with a picked up house. Every night at 7 PM, our trustworthy Alexa begins chirping to let us know that it’s time to clean. And we get to work. Everyone but Honor pitches in. (Still trying to figure out how to train an almost one-year-old who doesn’t walk to throw away his own diapers). The smaller kids repeat a version of the picking up routine they do in the mornings, every now and then with the addition of a rug vacuum. And the older boys and I usually tag-team the dishes + large pan scrubbing + sweeping. Shaun helps with picking up, redirecting wandering attention (AHEM, Theo and Twins), trash duty, or whatever else needs doing. Gittin ‘ur dun. P.S. She’s standing on my fave kid stool of all time. The milk is out. Dishes are piled in the sink. The island is strewn with leftover…stuff. And I do believe there are containers of garlic powder and cayenne on the sofa table??? Don’t be deceived. This is clean-from-a-distance. Some nights, I have time/energy to wipe down the cabinets or rearrange the fridge if the dishes are light. Most of the time, though, this is simply main surfaces wiped down, floors swept (not mopped), dishes done, and clutter put away. It’s not deep-cleaned. But do you know what it is? Stress-free!! Half an hour of corporate cleaning makes my brain go AAAAAAHHHH every single night, and it’s glorious. Now, obviously, I have lots of helpers, and some of my kids are older. But that also means that I have more mess-makers. And I can tell you that, after years of training the little ones, they are finally starting to get it. (So, if you only have wee ones, there’s still hope). The olders were gone the other night, and Della (7), the twins (5), and Theo (3) managed to help with dishes, pick up and vacuum the living room, put away toys, and throw away trash quite proficiently. MOST of the problem with everything feeling so overwhelming was my assumption that–even though I require my children to help throughout the day–once it hit evening time, I was completely responsible for setting everything right. (No clue why). And, given how tired I usually am, many nights, that just wasn’t happening. With the result, of course, being a more cluttered and stressful start to our mornings. The oh-so-subtle shift from: this is MY responsibility to this is OUR responsibility and let’s see how quickly and joyfully we can knock it out has done wonders for my energy levels, motivation, and attitude. The kids don’t mind a bit. In fact, because of the music and camaraderie, they actually–gasp–enjoy it. Another important part of our evening routine: the older kids’ reading the children’s Bible to the oh-so-attentive littles after we clean. So, there you have it. The little cleaning trick that has revolutionized our nighttime routine. Notice that it’s similar to the other mom’s idea but not identical. Different time. No conga line. BUT. The elements of togetherness, fun, and work are still present. And I think those are the keys. Let me know if you give this a shot or if you already do something similar. I can’t believe it took me so long to implement this (thanks, Shaun), but I’m so glad we did. P.S. I’m working on a no-sock-left-behind system that my Instagram peeps helped me devise, and I can’t wait to share it soon. You said your Instagram peeps help you with a place, but the link above to your IG shows no post or anything. Is there another link for your IG? Would like to follow you there. Thanks! Hey, Betsy! Not sure which link above you’re referencing. Unless I’m missing something super obvious (always a possibility ), but my instagram is @m.is.for.mama. Hope that helps! Also, no clue why that was anonymous. Yes! I am always amazed how much we can get done working together. We do a 10 minute tidy up every day right when I’m cooking dinner and my husband is going to be home soon. I crank up the Disney Pandora channel. I heard another mom of a big family say she jokes “When you do evil with one hand do good with the other” meaning if you help tear it up then help put it back together. 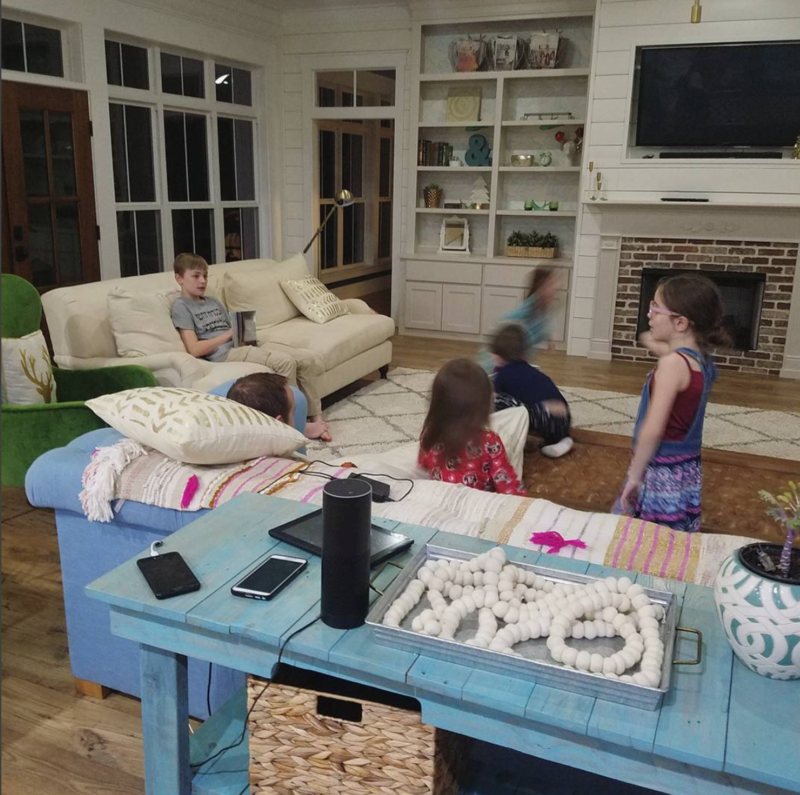 I’m in a constant quest to find the right amount of stuff I can handle managing without my home getting so messy, but I suspect the journey is the point with 6 kids ages 10 and under. Hi Abbie, great post. Is there a vacuum you find works well for your kids to use? Thanks! Hi Gretchen. I got a refurbished Dyson from Overstock. Can’t remember the name (maybe something to do with an “animal?? ?,” but it works pretty well on rugs and bare floors and isn’t too heavy for the kids to use. 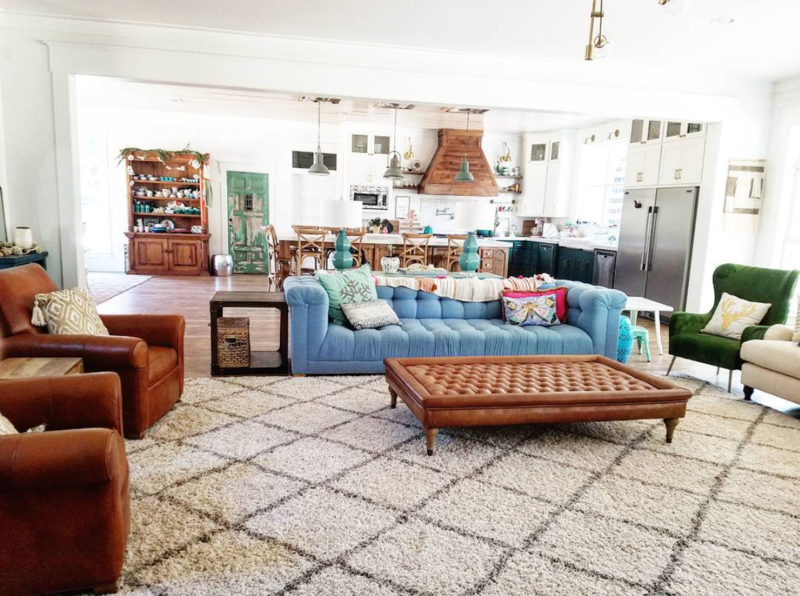 The blue one is the Kettleby sofa from Anthropologie. BUT! I got mine at a deeeeep discount bc it was a floor sample (full price, it’s very expensive). And the cream colored one is the Pottery Barn Carlisle (I think that’s the name). But again, I got it secondhand for a tiny fraction of what it costs in store. Thank you! Love it so good when we can find great deals like that. Great post! I enjoy reading how other large families run. I have 7 children ranging in age from 5 weeks to 14 years. I am unfortunately one of those people who is slightly obsessive about deep cleaning, sorry kids! We do a similar cleaning in he evenings on school nights (public school for us), and again in he mornings before school. It’s absolutely essential for my sanity! I do the deep cleaning downstairs and help out upstairs when things just need a good “mom clean”! And yes to training the kiddos! They really are a huge help! Another big help in our new house has been keeping all our most used dishes down low in drawers. Now even the very little ones can unload the dishwasher! Also having a second laundry upstairs for the kids has been extremely helpful! You had your baby, Autumn! Congrats! Tell me your kids ages/genders, please! I always enjoy hearing from you. Interestingly, each time we found out the gender the baby was a girl and each time we chose to wait it was a boy! I enjoy checking in on your blog! You have a beautiful family and home! What sofas are those? Love them especially the blue one. I need a no loose cushion sofa with my kids who think every pillow belongs on the floor. Love the look of those step stools as well. But $67 for two of the mint ones, yikes!! Had no idea they had that kind of a price tag. I find mine on Amazon Warehouse Deals. Usually $40 for 2. You do have to be patient looking for the color you want. I have to say, though, as much as we use them and as well made as they are (and as many other cheaper options that I’ve tried that either flipped or fell apart), I think they’re worth $20-$30 each.